In last week’s post I took a look at data from the PWC MoneyTree Report to answer the question “does Georgia have a venture funding shortage?”. The data supported what I keep hearing from Atlanta entrepreneurs – we have a venture funding shortage, especially seed funding. This is to difficult to digest while reading stories that other areas are experiencing a ‘bubble’ in early stage funding. 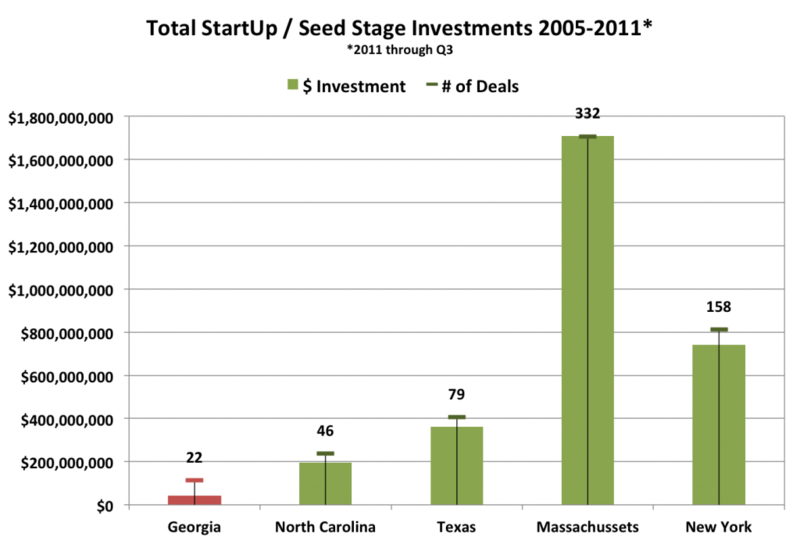 Adding to the shortage is the fact that two sources of local seed funding have recently stopped making new investments. Imlay Investments, the most active seed stage fund in Georgia in the last decade, made their last new investment last year and are now focused on their 37 active portfolio companies. The Georgia legislature stopped funding the ATDC Seed Fund several years ago and “reallocated” $5 million in previously allocated funds, essentially halting new investments. Since writing the Does Georgia Have a Venture Funding Shortage post, the Atlanta Business Chronicle published an article stating the General Assembly is expected to take up a proposal this winter to establish the Georgia Venture Capital Program establishing a $180 million fund that would follow a fund-of-funds model that has been successful in other states like North Carolina and Texas. I hope this happens. It seems to have strong support and the right mix of legislators and leaders in the technology community supporting it. I also hope a meaningful portion of that $180 million is directed to a privately managed seed fund (or funds) to help more seed stage companies succeed. It’s the first step in any plan. In order to accomplish one of the goals mentioned in the article of “serving as a financial magnet” to attract out of state funds to have a presence and invest in Georgia, we’ll need to increase the deal flow of quality companies. To have more quality early stage, expansion stage, and later stage companies for VCs and private equity firms to invest in, we first have to address the ‘top of the funnel’ by starting with supporting more (ambitious) seed stage companies. What else can we (Georgia, technology community, ATDC) do to increase access to funding and grow more companies pursuing ‘big ideas’? I attended Venture Atlanta last week – the largest annual start-up technology conference in Atlanta. The event filled the Oceans Ballroom at the Georgia Aquarium, an appropriate setting for start-ups looking to ‘swim with the sharks’. Founders of healthcare IT, software, fintech, and digital media companies seeking funding gave 6-minute pitches hoping to attract funding from the investors in the audience. I wasn’t able to attend last year, but compared to two years ago the event was a big step up. Kudos to the VA 2011 team. The companies received countless hours of coaching leading up the event – and it showed in the quality of the presentations. I don’t have exact numbers – but there were easily over 500 attendees and hundreds of venture capitalists and angel investors. The large number from outside Georgia including tech hubs Silicon Valley and Boston was encouraging. The biggest change was the event added a second day focused on earlier stage ventures seeking seed financing or series A financing. ATDC’s impact on the start-up community was evident. I was proud to see 13 of the 20 early stage companies presenting were ATDC Companies. 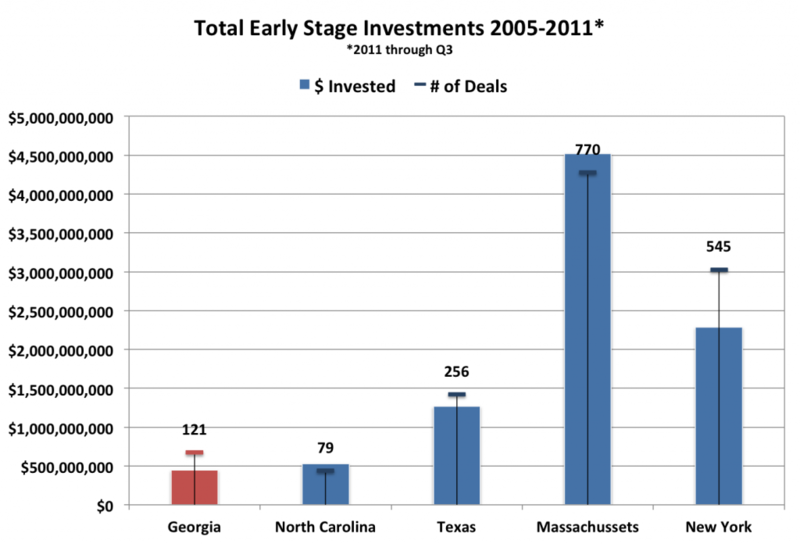 At least a third of the later stage ventures were ATDC Companies or recent graduates as well. There is a sense of energy and support for Atlanta’s technology entrepreneurs. The number of organizations and volunteer assistance available to Atlanta start-ups is incredible. This ‘eco-system’ is helping to fuel the start-up community. We have ATDC, a technology accelerator at Georgia Tech, Flashpoint, Start-Up Chicks, TAG, and numerous other for profit and not for profit organizations providing invaluable assistance to our local start-ups. Previously fragmented organizations and local venture capitalists are starting to work together and that is part of what created the ‘celebratory’ atmosphere Jesse Dwyer referenced. Atlanta start-ups seeking funding are farther along than start-ups you’d see at similar events in other parts of the country. Ryan Gembala of Azure Capital, a Silicon Valley venture firm, commented that Atlanta start-ups find revenue earlier in their life cycle as a funding source in light of the undercapitalized market. That works well for many internet capital light ventures, but is more difficult for ‘big ideas’ and deep science or technology start-ups. You couldn’t help but come away excited about Atlanta’s start-up technology community. John Yates of Morris, Manning & Martin put together a great video that was shown at Venture Atlanta capturing the ‘celebratory’ atmosphere of the technology community. The video featured tech leaders in the Atlanta Community discussing the history of Atlanta’s technology start-up growth. Click Here to view it.